Why did Sacramento officers who shot Stephon Clark mute their bodycams? The unanswered questions about the muted cams have stoked suspicion among Clark's family and protesters. Police officials in Sacramento, California, boast about their use of body cameras, and the quick release of the footage they capture, as centerpieces of a larger effort to improve the public's trust. But the fatal shooting by police officers last week of an unarmed black man, Stephon Clark, has exposed a potential flaw in that effort and opened up a new front in the national debate over body cameras: officers' ability to turn off the microphone on the device. Body cam footage from the two officers who shot Clark in a residential backyard after dark on March 18 includes the chase, one officer shouting "gun" in a mistaken belief that Clark was armed, then the gunfire. It also covers the aftermath, as backup arrives and the officers walk to the street. During their exit, one officer says, "Hey, mute." Then the audio on both cameras goes silent while the video continues to show authorities responding to the scene. Why the officers muted their body cameras remains unclear. Police Chief Daniel Hahn said last week that he could not explain it. He said there were "various reasons" why officers would turn off their cameras' audio, but he would not say if the Clark shooting was one of them. The muting, he said, would be part of his agency's investigation of the shooting. The unanswered questions about the muted cams have stoked suspicion among Clark's family and protesters, who have criticized the shooting as an illegal use of force. "When I heard [about the muted cameras] I felt it was intentional," Sonia Lewis, a cousin of Clark's, said last week. "You're muting something you don't want the public to hear what you're saying, and that means that if you don't want the truth to come out then all of it is a lie." The family's attorney, Benjamin Crump, plans to file a wrongful-death lawsuit, he told the Daily Beast. 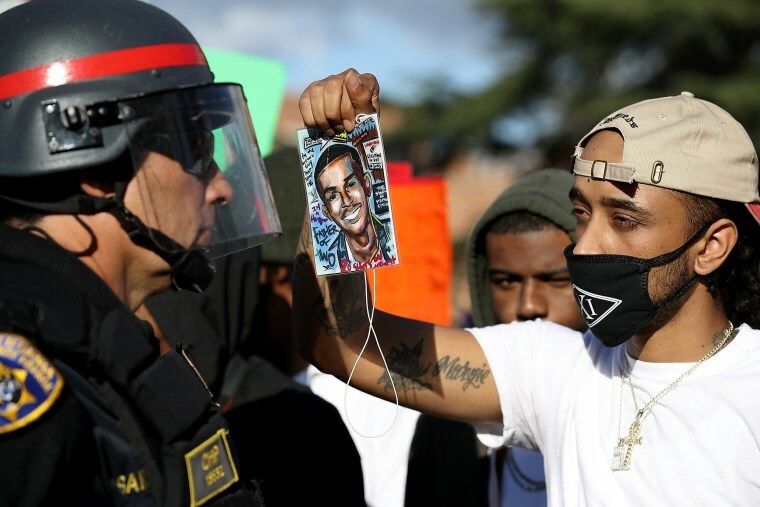 Crump said in a statement to NBC News that "we're exploring every legal remedy possible to get justice for Stephon Clark." He also said that Clark's family "feels that the muting of the mics suggests they were up to something nefarious; to them it suggests they were conspiring to be deceitful." Betty Williams, president of the Sacramento branch of the NAACP, said at a Monday news conference that she had demanded that the police department share its protocol for muting body cams, and consider changes. The mute function on body cams is a relatively recent development. Axon, the company that makes the cameras used in Sacramento, said its "second generation" cameras are delivered without the mute function active, but it is "provided as an option for the agencies if they want to use it." Sgt. Vance Chandler, a Sacramento police spokesman, declined on Monday to say why the department decided to activate the mute function on their cameras. He said officers are taught during body-cam training "to utilize mute" in certain situations, but would not say what they were. "That's part of what we are looking at in this incident," he said. He added, "We want to determine if this was an appropriate time for them to mute it or not." The city's body-cam policy, which is posted online, does not mention muting at all. It says that officers should record "any enforcement or investigative activity" until that operation has "reasonably concluded." The policy adds that officers may deactivate their cameras under some circumstances, including talking about confidential or tactical matters, or for privacy concerns, as long as the reason is documented afterward. Cedric Alexander, a former police chief in Rochester, New York, and former public safety director in Dekalb, County, Georgia, said he saw nothing wrong procedurally with the Sacramento officers muting their cameras in the aftermath of the shooting. Attorneys would advise officers to do that, to avoid recording comments that could be used in administrative or criminal proceedings, Alexander said. But Alexander, a former president of the National Organization of Black Law Enforcement Executives and a member of the Task Force on 21st Century Policing under former President Barack Obama, said that while the muting didn't appear to break any rules, it looks bad. "The problem is the optics of this," Alexander said. In the immediate aftermath of shootings, officers often share what they experienced with their colleagues, said Jim Bueermann, president of the Police Foundation, which helps departments improve and reform. "My guess is one of them is about to ask what happened or he has a compelling desire to tell his friend what happened and why he did it," Bueermann said. Bueermann said the muting of body cams does not appear to be unusual among American police officers. Agencies can request muting functionality from body-cam maker Axon, he said. But many agencies don't have policies covering how mute can be used. "There's a void in many agency policies, and I would be surprised if they were not soon filled in response to the Sacramento incident around the muting," Bueermann said. He pointed to San Francisco, where last year the police chief required officers to document when they muted their body cams. As investigators examine what happened in the Clark shooting, his family is preparing for his funeral on Thursday. “I want justice for my grandson,” said Clark’s grandmother, Sequita Thompson, at Monday's news conference.